For the final piece in the Red series, I made a background from the fabric and thread scraps of the earlier pieces using the embellishing machine and a piece of black acrylic felt. After stitching it to emphasise the perspective, I applied a black pseudo felt image derived from a copyright free image from the internet. 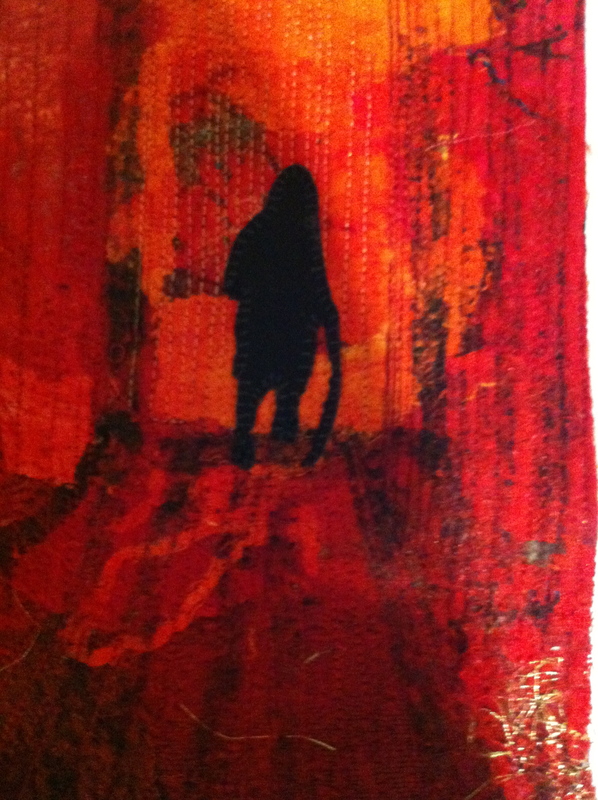 This entry was posted in Machine (dry) felting. Bookmark the permalink. This is my favourite I think Margaret. You’ve achieved a real sense of depth and perspective with the stitching and the use of tonal variations. There is also a sense of wanting to know the story associated with the person depicted. I know – it took me so long to do more than plonk a technique down! I like this too an dcan see what you mean! BTW, it must have been the artistically conducive surroundings in your studio! Thanks for printing the figure too!